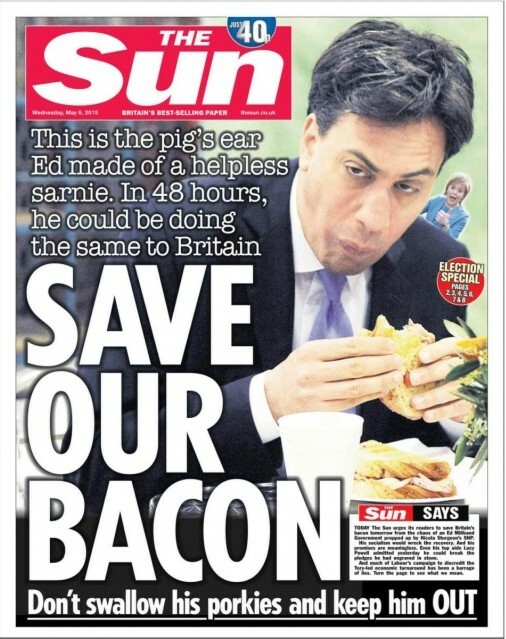 The Rupert Murdoch-owned UK tabloid The Sun reached new depths this week. That Murdoch, an Australian-American can so blatantly intervene in British politics is of course galling enough. His discredited newspapers have been implicated in the phone hacking scandals, necessitating a personal apology from Murdoch to the family of a murdered child Milly Dowler, after his newspaper had hacked the dead girl’s phone. “I am not religious. But I am Jewish. My relationship with my Jewishness is complex. But whose isn’t? Against the backdrop of the election, held the next day on May 7th 2015, which saw millions unashamedly voting for the blatantly racist UKIP party, The Sun did it’s best to overturn Milliband’s assertion that “The first Jewish leader of the Labour Party.” It says something about me and about Britain that I am rarely described as such. The Sun did what it could to slur Milliband on racial lines, making sure Milliband’s Jewishness was front page news – and it makes my blood boil. This entry was posted in Marketing, Newspapers, Politics, Propoganda and tagged antisemitism, Bacon, Ed Milliband, Labour Party, Milly Dowler, Rupert Murdoch. Bookmark the permalink.